Guatemala City – Central American and Mexican activists are questioning their governments’ focus on security to address migration following meetings this week with US Secretary of Homeland Security Kirstjen Nielsen. Nielsen met with Mexican officials on Tuesday and attended a summit Wednesday in Honduras with security ministers from Honduras, Guatemala and El Salvador. The meetings dealt with border security and the ongoing exodus of Central American migrants and asylum seekers. The summit in Honduras ended with the signing of a regional memorandum of cooperation between the three Central American countries and the United States. According to the Department of Homeland Security, the memorandum “aims to better synchronise cooperation between the countries in order to bolster border security, prevent the formation of new migrant caravans, and address the root causes of the migration crisis”. In a series of tweets, Nielsen described the memorandum as a “first-ever regional compact” and “a HISTORIC agreement to confront the root causes of the crisis on our border”. “It is accepted up to a certain point that insecurity and violence are a factor in driving certain populations to migrate,” Hernandez told Al Jazeera. “The problem is standardising the approach to the origins of migration and instituting policies only on that basis,” she said. Degenhart’s initial vice minister, Kamilo Rivera, is accused of participating in a torture and extrajudicial execution ring run from within the ministry in the past and is now a fugitive from justice. Mauricio Lopez Bonilla, Degenhart’s predecessor, is on trial in Guatemala for corruption and has also been indicted in the US on drug trafficking and weapons charges. “The Guatemalan government is a partner and supporter of US security efforts in the region. However, the repeated misuse of US-provided military vehicles has necessitated a review of support to security cooperation programmes,” Michael told Al Jazeera. One day after the March 14 announcement, more than 130 donated Jeep J8s gradually all began arriving to capital city airport area air force base grounds, where they were lined up in front of a hangar used by the US. 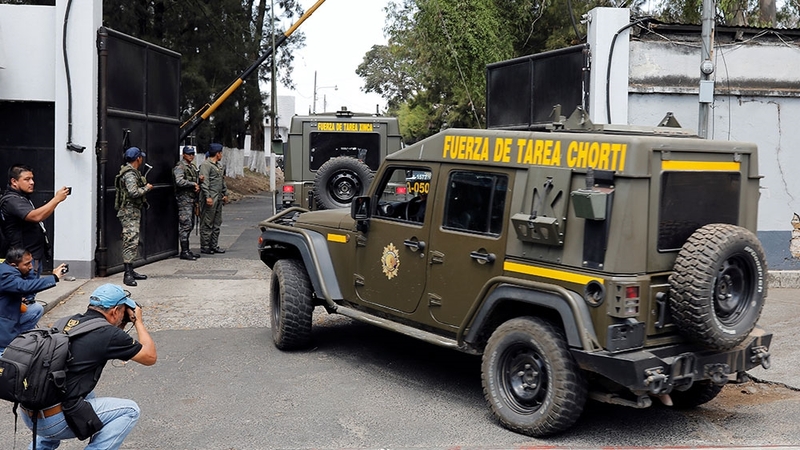 In response to criticism earlier this year, Guatemala’s secretary of state intelligence had offered to drop the jeeps off in front of the US Embassy and another defiant offer to return the donated vehicles seemed imminent. But after days of silence, the Guatemalan government claimed the jeeps had been recalled for mechanical review and deployed them back out into the country days later. “It is very likely that that absurd action of positioning all the jeeps in front of the US hangar will also have consequences down the line,” said Hernandez. Despite the military aid suspension and questionable Guatemalan government response, Nielsen cited “improved cooperation” with the Central American countries involved in the security cooperation memorandum. Democratic Congresswoman Norma Torres criticised the memorandum in a statement Thursday, calling it a “misguided agreement” and highlighting the involvement of security forces with drug trafficking and organised crime. “Far too many Central Americans have already suffered at the hands of corrupt and abusive security forces; they are demanding justice, not a blank check for soldiers and police,” wrote Torres. “For years, members of the Honduras police and military have engaged in corrupt practices and gross human rights abuses without consequence. By limiting funding, we have the opportunity to force the Honduran government to investigate and prosecute these crimes,” Johnson said Thursday in a statement. Over the course of the past five months, Al Jazeera has spoken with many Hondurans who cited targeted repression and violence by state forces as their reason for fleeing north, though poverty, unemployment, and gang violence are more often cited. Individuals’ reasons vary, as does whether or not they travel in visible caravan groups, but either way, the exodus continues. Mexican secretary of the interior Olga Sanchez said Wednesday that the Mexico is expecting a “mother of all caravans” from Honduras that could include as many as 20,000 people. Her comments came on the heels of a meeting Tuesday with Nielsen. Announcements for a Honduran caravan leaving Saturday from San Pedro Sula have been circulating on social media, but the source of Sanchez’s dubious claims concerning its size is unclear. Honduran deputy foreign affairs minister Nelly Jerez contested the claim. “Intelligence forces, not just those from Honduras but also the ones that were here meeting with secretary Nielsen in a Northern Triangle meeting we had in our country, none of us has any information about the formation of a mass departure or mobilisation of people,” Jerez said Thursday in an interview with Mexican newspaper El Sol de Mexico. Migrant rights activist group Pueblo Sin Fronteras accused Sanchez of serving Trump’s immigration policy interests by inciting fear to justify harsh measures against Central American migrants. “The only certainty is that after the meeting with Nielsen, the Mexican government put forward the ‘mother of all caravans’ idea in its discourse to justify the US mandated containment,” the group said Thursday in a public statement. Meanwhile, Trump appeared to contradict Neilsen’s celebration of the regional security cooperation memorandum, accusing Central American countries and Mexico of “doing nothing”. On Thursday, he threatened to close the southern border in a tweet, saying “Mexico is doing NOTHING to help stop the flow of illegal immigrants to our Country”. He added, “Likewise Honduras, Guatemala and El Salvador have taken our money for years, and do Nothing”. Trump has made the threat several times before, but has never acted. On Friday, he repeated the threat, however, saying he would close the border next week if “Mexico doesn’t immediately stop ALL illegal immigration coming into the United States throug (sic) our Southern Border”. Mexico’s foreign relations secretary, Marcelo Ebrard, responded, saying “Mexico doesn’t act based on threats”.